What’s in this Week’s Box? There’s Veggies still in the fridge, and it’s Thursday again? If You Should Keep it or Toss it? Lady Locavore Reaches 10,000 Hits! What does Organic mean to me? Why Eat Vegetables? Why Eat Organic? Why Eat Fast Food? Why Eat Raw Food? Are Organic Foods Really Better? We are so happy to be able to offer farm fresh eggs every week. 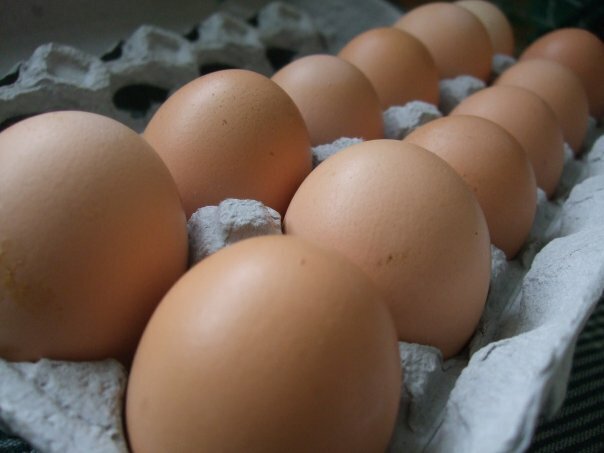 What is the difference between our eggs and the eggs you find in your grocer’s store? Green grass and range-free, literally speaking. If you happen to come by on any given day, you will find hens allowed to roam around the property, choosing to nestle in the shade or enjoy the warming sun. They can walk, run or lounge. While roaming, they peck off clover leaves, grass, a favourite herb or a veggie here and there. They diligently scratch in the soil looking for small bugs and seeds, dig holes to take sand-baths, whilst listening to the rooster’s crow. Of course hens also like grain, not greens alone, the farmers and their families jealously guard what goes into their grain rations. No meat meal, feather meal, or blood meal and no baker’s waste. In an effort to be GMO free, close attention is paid to feed sources. Older variety grains are used such as oats, barley and wheat. During the winter months, grass is scarce because it does not grow in January. Days are shorter, so it is just the same with daylight. The hens tend to slow down some in egg production because of that. During these frigid months, hens must accept second best, just like the rest of us. So, they get to have more of a dried-bean, squash and pumpkin diet along with their grains. This is in effort to see if more varieties of winter crops can sustain and keep away their “winter blues”, when their production does reduce. During this time, most older less productive hens become stewing meat for hearty winter soups. This small flock of around a-hundred in total, hopefully will keep producing a good quantity of eggs for the season and seasons ahead if all goes well, and the farm can keep the predators away. Those cute raccoons and tom-cats both make eggs a fare-favourite and are a constant battle on the farm. The farm is a grand, complex system of sun, rain, soil and living growing things – a contributing link in the balance of a thriving eco-system. This entry was posted in Uncategorized and tagged Eggs. Bookmark the permalink. Hello, I have been reading your blog and it is very inspiring. We are new to London and decided to get a CSA food box and it is great! I just read about the eggs on the farm as well. Can you let me know if it I can purchase eggs from the same farm? Am I too late to order for the season?Also, can I get information on signing up for the winter season as well. I pick up our food box from On the Move Organics. Please send an email to ladylocavore@hotmail.com to get your name on the mailing list for the Fall CSA which starts in October. Also, feel free to follow us on the Facebook page.